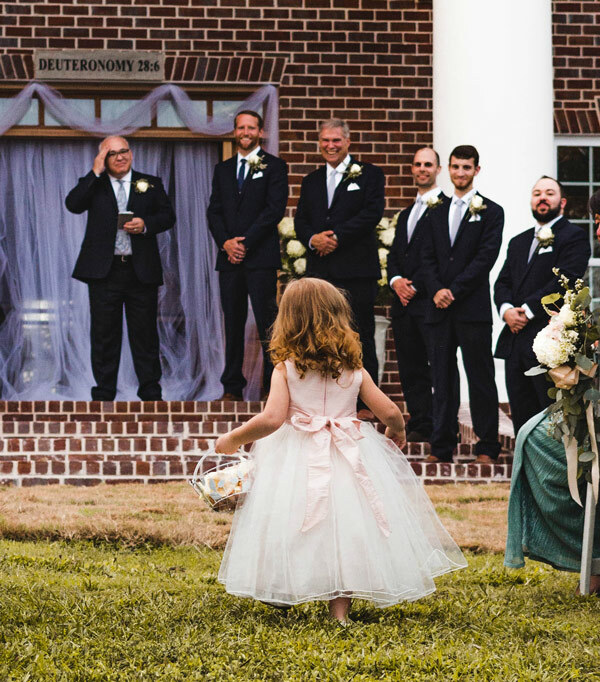 Flower Girl (ages 4 – 8): The flower girl tosses petals on the aisle before the bride walks down. You can have as many flower girls as you would like. Gift Attendant (ages 12 and up): A gift attendant is responsible for the gift table. He or she watches the table during the reception to ensure that gifts remain on the table. After the reception, he or she helps to load the car with gifts. This is a simple role that is great for the responsible child or two. Guest Book Attendant (ages 14 and up): The guest book attendant’s job is to get people to sign the guest book. He or she should be in the location where this is feasible and should ask each person that enters to sign the guest book. This is not a role for a shy child but should be reserved for someone who is friendly. Junior Bridesmaid (ages 8 – 14): This role is reserved for girls who are too old to be a flower girl and too young to be a bridesmaid. In most cases, her only role is to come to the rehearsal and walk down the aisle. Some couples do include junior bridesmaids in other festivities such as a bridal shower (but no bachelorette parties). Junior Usher/Groomsmen (ages 8 – 14): This role is reserved for boys who are too old to be a ring bearer and too young to be a groomsmen/usher. As a junior groomsmen/usher, his duties include going to the rehearsal and walking down the aisle. As a junior usher, he helps seat wedding guests. A junior usher/groomsman cannot be invited to a bachelor party but can be invited to co-ed showers if the couple wishes. Personal Attendant (ages 14 and up): The personal attendant is expected to help with the preparations before the ceremony and/or reception. Duties vary, but this person (boy or girl) is a “wedding helper” and helps the bride or groom where needed. Examples could be helping with bringing water to the bride or groom, bring snacks to their designated rooms prior to the ceremony and other needed help. Ring Bearer (ages 4 – 8): The ring bearer has the responsibility of carrying the ring(s) down the aisle. You may have two ring bearers.